Ah, yet another in the long-running series of shots brought to you by my set of close-up filters. This one was a bit of a surprise for me for a couple of reasons, not the least of which is the sheer amount of pink and red in the image. I mean, wow. It kind of hurts my eyes just to look at it which is why I nearly dismissed the picture entirely upon seeing it in my Lightroom catalog. And yet I decided to keep it, edit it, and ultimately post it here on Weekly Fifty because of reason two. When I was looking around one of the gardens on campus armed with my D7100, 50mm lens, and close-up filters I was only looking for some flowers and not anything in the way of animal life since at this point I’ve basically ruled out the possibility of capturing bees, bugs, flies, or anything of that nature with the skill and equipment I have. I mean seriously, when there are photographers who can do stuff like this, it simultaneously inspires me while also making me want to chuck my camera in the trash because I’ll never be that good. But as I often tell my five-year-old son, it’s not a competition. If I’m using my camera to capture images I like, then it’s all good. Hopefully I’m also getting inspired and challenged by other photographers and using their works as creative outlets to explore personally, and that all goes back to Reason Number Two which you might have noticed I haven’t exactly articulated yet. See that little bug in the lower-left of this photo? I kid you not, I didn’t even notice it (he?) was there when I shot the image. 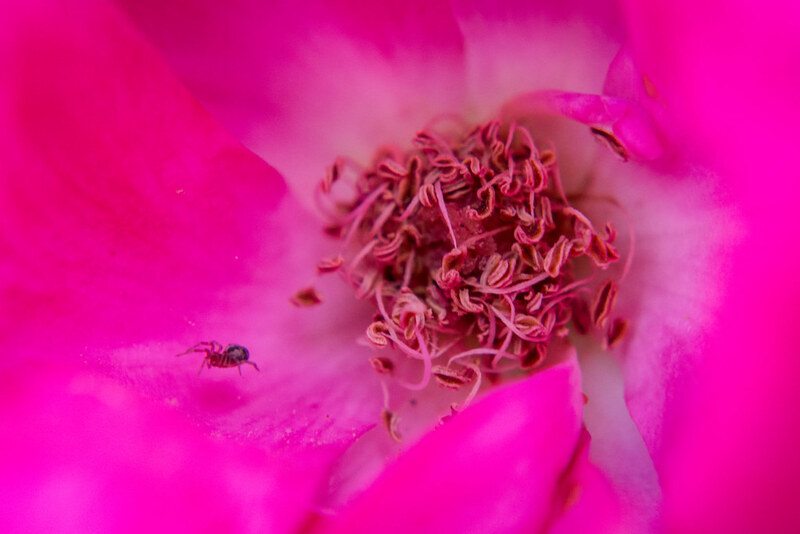 He must have been about 1/8″ long and I was concentrating so much on the center of this rose that I didn’t even notice the insect crawling outwards towards the sunlight. It was only afterwards in Lightroom that I saw the little fella boldly bolting towards the outskirts of the flower, and thought it added an interesting dynamic element to an otherwise fairly simple shot. I’m a little disappointed that the bug is not in focus, but it’s close enough and while I wouldn’t go with close enough when working with clients, it’s just fine here since I see it as a demonstration of my learning and photographic progression. Thank you Simon for writing yet another inspiring post. It is very re assuring to know that you realize your own limits and happy with what you can and have accomplished, i.e. relatively simple camera and closeup lenses. I like your link of an experimental very high tech photography of an insect and wind mill. By reading so many of the wonderful high tech photos online, one has a tendency to get depressed, leading to unnecessary GAS (gear acquisition syndrome ). Your article is a good antidote for that affliction. Oh man, don’t even get me started on Gear Acquisition Syndrome! I remember years ago when I told my wife that a Nikon D200 and a 50mm lens were all the things we needed…and now I’ve got an ever-growing shelf of cameras, lenses, tripods, bags, filters, etc. Sometimes I think it would be good to chuck all that and stick with the basics! Wow Dennis, that is a compliment to your skill and focus that your wives thinks the bugs are real. I’m thinking the same thing Dennis! I can just imagine your wife turning on the computer and immediately swatting at the bugs and insects…only to realize they’re just photos. You must have some outstanding shots! Hey! What not good enough are you talking about? Would you allow your son to get away with that talk? Isn’t it funny how we get so focused on the tiny bits of the photo that we intend to capture that we don’t notice the bits that are scurrying to get out of our way? Go out and look for bugs. You have the skills! Thanks Rebecca! I really appreciate your encouraging words :) And you’re right about the way we look for so many tiny little things in our photos that we can easily overlook the other elements that can add just the right touch to our images. Even if they’re right in front of our eyes! Glad you kept it! As a person drawn to color, especially to the family of shades represented in this photo, I was interested to learn from Samantha that a really fun way to play with filters on a high school student’s budget is to use the type of filters commonly utilized by the stage lighting crew of the school’s drama department. Good point about the lighting filters that you might see in a Drama department, Marybeth. It’s amazing what putting a little blue, red, orange, or green filter over a white light can do as far as changing the emotional impact of a scene. You know, Simon, your pictures are not the only thing your audience finds interesting? It is often your commentary that we all read, where we learn about your passion for the art of the camera. You have a way with the focus and the lens, but also a way with words which make it interesting for the rest of us. I think it ‘s so great that you are willing to put your photography up against others in your local club, Glenys. I would be so nervous at the thought of doing that! What you said reminds me of something my wife once told me from back in her days of running Cross Country in high school. She said a lot of CC running is about competing with yourself, not others, and trying to beat your own Personal Best records. I feel like doing what you do is kind of like that: you’re trying to learn and grow in your own way, and as long as you see improvement in your own work over time then it doesn’t matter what anyone else does. Certain judges can be very helpful and constructive, others not so, you just have to accept that is is only their opinion. Aim to be better and just take images that you like and are happy with as long as you are improving and enjoying what you do. I am in the 8th decade of my life, so am lucky to be still able to do this photography.